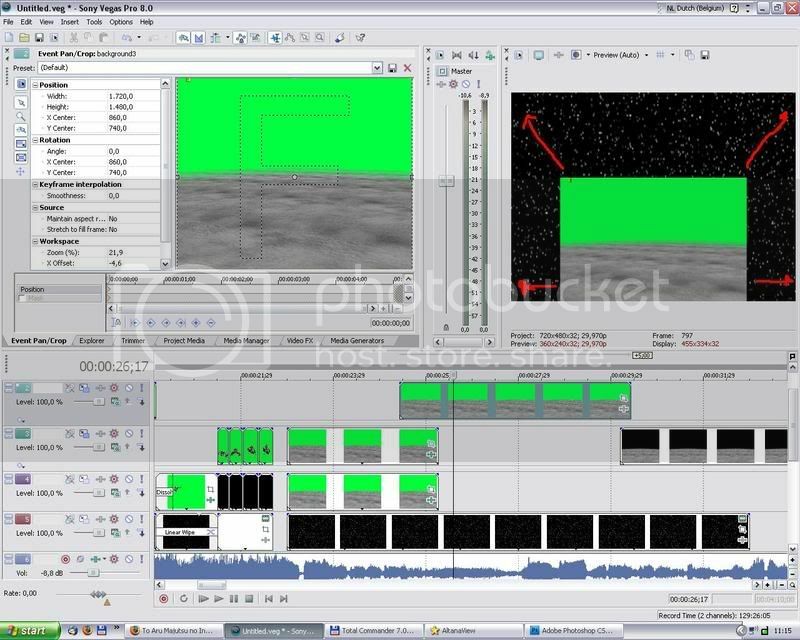 For help and discussion concerning Magix's (formerly Sony's) Movie Studio and Vegas Pro editing software. can you still shift click and drag the clip to the length you want it?? its a very annoying problem, and ive already tried messing with all the settings in the crop-window, all i can do is drag it around a bit.. If you find that your source files have slightly different frame sizes, would clicking the stretch button under the rendering settings in vegas make everything appear even in size again once it's all rendered into a single file? Kumatora wrote: SquallxRinoa(one of my favorite pairings), just how long have you been working on this video? I've been coming to this thread for a while and I've noticed that your help screens consist of Kingdom Hearts series footage. Have you been working on one for video for the last several months, or what? And I noticed that 79% of my posts were in this forum and 70% in this thread xD Reading my old posts....Gawrsh,I was a bit of a noob back then wasn't I? for me it goes all wrong when I set a path with the anchor tool, and go a second further to adjust my path..
its probably the split anchor tool going haywire - it does that for me sometimes - you just have to right click the anchor and tell it to unsplit the anchor. also make sure you're using the arrow to move your anchors around instead of the anchor creation tool because if you click an existing anchor using the anchor tool then you will just split it which results in what youre explaining. Ghet wrote: its probably the split anchor tool going haywire - it does that for me sometimes - you just have to right click the anchor and tell it to unsplit the anchor. the option you're gonna be looking for is "Hide tangents->all"
for that you just need to click outside of the mask, when you finish up masking it automatically selects all anchors. so if you click outside of the mask it unselects it and you can move each anchor individually.